The McDonald Library is located near the corner of Harold and Dana Avenue. This building contains most the the library's collections, including archives and special collections. The Conaton Learning Commons is located at the corner of Dana Avenue and Francis Xavier Way. This building hosts the Connection Center, an integrated service point, blending library and help desk services. The two buildings are joined together on the third and second floors of the McDonald building. 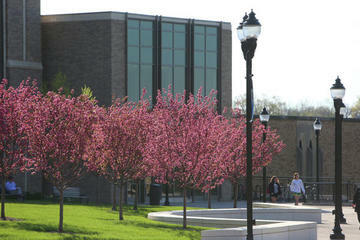 This purposeful connection provides a pathway from Xavier University's older campus buildings to the new - Smith Hall, Hoff Dinning Commons, and Bishop Edward Fenwick Place. The juvenile and folio collections are located on the first floor of the McDonald Library. The second floor contains periodicals with current issues and bound volumes together in one alphabetical display. Part of the main collection (PQ-Z) and audiovisuals are also housed on the second floor. The third floor contains the majority of the main collection (A-PQ) as well as reference, archives, and special collections. McDonald Library provides study, lounge, conference, and instruction space with an emphasis on individual and quiet study. It houses photocopiers, computer workstations, and printers. 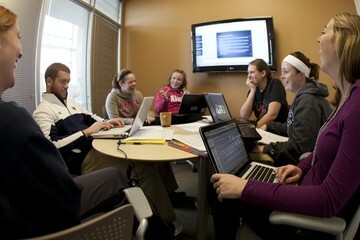 The Conaton Learning Commons also provides study, lounge, conference and instruction space, but with an emphasis on group study and collaboration. There are 13 group study rooms that vary in seating capacity from 2-3 to 6-10 people. Nine of the rooms have plasma screen projection with access to the Web. There are two mini academic computing labs on the second and third floors that provide access to photocopiers, printers, scanners, digital senders, and computer workstations. A food kiosk is located on the fourth floor and vending machines and student kitchenette on the second floor. The Connection Center, located on the third floor of the Conaton Learning Commons, brings together at one desk circulation, traditional reserves, research, computer technology, and classroom support services. Other student support services in the Conaton Learning Commons include the Learning Assistance Center, Math Lab, Writing Center, Language Resource Center, Academic and Athletic Advising, and the Digital Media Lab. Other support services for faulty include the Center for Teaching Excellence, a faculty lounge, an experimental classroom, a classroom equipped with 28 computer workstations, 2 additional classrooms, a seminar room, and an auditorium.